It took an inordinately long time this morning for Jasper to make his way down the hall and take up his place by my side for our customary daily sharing of toast. This has been our way for years. I’m not proud that I taught him to beg food from me, but I don’t think of it as begging. It’s more like sharing, really. It’s more like polite requesting, though there have been times when it’s gone a little too far, chin resting on the edge of the table or on my knee, eyes imploring. But chinnies is so cute that I don’t care. We play a little game at breakfast. The moment I look at Jas, his tail starts to beat the floor. The moment I look away, the tail slows to a stop. Look: tail beats. Away: tail stops. I can’t tear my eyes away from him these days. Our boy is so slow right now, suffering as he is from what we now think is almost surely congestive heart failure. 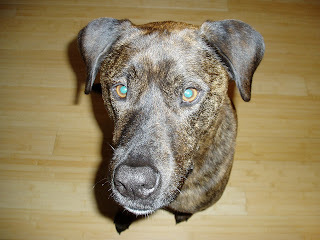 Our once super-active dog and we are adjusting to this new normal, this greatly-slowed pace. He doesn’t finish his food, no matter what goodies we tuck in his bowl to entice him. This has never happened his whole life. He abandoned his toast post very early this breakfast and is now curled up under the table a few feet away from me, too far for me to hand him bits I tear off my bread. This is all so new and strange and unlike him that it is almost unfathomable. We used to spend hours in the hills, Jasper and I, running and walking, Jasper after every rock that rolled down hill, every rabbit or deer that happened across our trail. This morning I’ll feel lucky if we can get out the gate and to the corner without poor Jassie having a coughing fit or losing his balance. I will only take him out because he still perks up when he hears the word “walk” and just to momentarily change his scenery. It’s a struggle to stay in the present, to not fast-forward. I fall apart regularly, and then force my eyes back to Jasper’s gorgeous brindle form, stuff my nose in his fur and breathe him in. None of us are here forever, but it’s so hard to let go. My mother once said, in 2009 actually when I was upset about Jasper’s diagnosis of canine melanoma (which he survived very nicely, thank you), that that’s why you shouldn’t have pets – it’s too painful. And this is certainly painful. But come on: to be clear, I’ve cried over every fish, every turtle, every hamster, every frog, every lizard, every single rat I ever loved and lost. I have loved them all. And this is by far the biggest love and the biggest pain of all. But I wouldn’t trade it, not if it meant that I wouldn’t have had these glorious thirteen years and six months of companionship with this remarkable, beautiful dog. We go in for more x-rays this morning. The having-something-to-do-about-it helps a little. The vets will be checking to see whether the meds Jas has been taking since last week are helping to clear the fluid out of his lungs. I think he’s doing better, but he’s still laboring. From there, we’ll discuss whether to take him to a canine cardiologist. What is the true state of his heart, and how much can we do to prolong his quality of life? And yet we bear it. We adapt to the new circumstances and we go on. Truly I would do anything to make this not true, to wield some magic in which his life extends the length of my own and beyond, in which he is always with me, in the woods, constant companion. In which I could give him my own heart, keep him here, healthy, prancing. But such magic doesn’t exist, does it. Even Dumbledore died. He will, we all will, return to the formless. I don’t have to like it -- right now I really, really hate it -- but there’s nothing to be done except keep my eyes on Jasper, savor each breath he takes, take each step as it comes, slower but with no less grace.